When the original Vista arrived it was a total revolution in lighting consoles. Version 2.0, now available as a public beta, takes this innovative approach to a new stage, introducing a true second generation of software, completely re-written from scratch and full of the features you‘ve asked for. On top of the usual recording method, Jands have added a far simpler method called ’Store Look‘ for users who need to work fast and don‘t need all the options available in the regular store window. ’Store Look‘ does exactly what it says: you press a button to store whatever ’look‘ is on the stage. This is perfect for situations where the ’lighting guy‘ isn‘t around, or if you‘ve built a look from a combination of playbacks and the editor and want it to play back exactly as you see it. In V2 there‘s a cuelist scroll bar and mini cue icons in both the Fixture chooser and the Timeline window so it‘s easy to move from one end of the cue-list to the other no matter how big your cuelist is. To edit a cue, you just click the selector tile representing the cue you want. Vista now includes Search boxes in the Fixture Library, Lee Colour picker, Groups, Presets, Extracts, Cue-list and Effects windows. You can trawl the hundreds of items in these windows just by typing the first few letters. As you type, the list filters down to the items matching the letters or numbers you enter. This narrows down potentially massive lists so you can find what you need in seconds. One of Vista‘s most popular features is the ’swing‘ effect, in which fixtures crossfade between two presets, colours, positions or other settings. 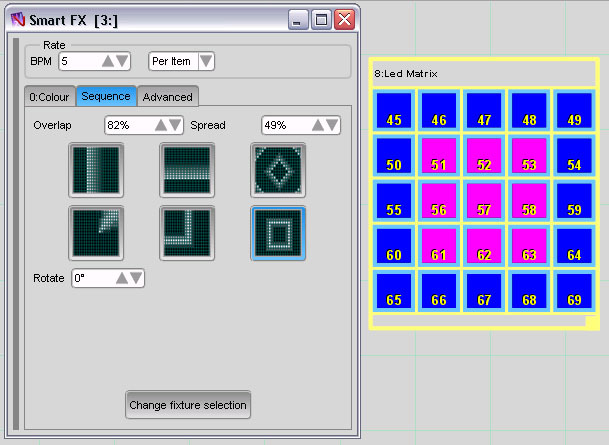 In V2 you can make swing effects pass through two, three or any number of easily editable points along the way. With Vista‘s patented Effects Synchronisation feature, you can create waveform based effects on one feature, such as colour, and then add a second feature, for example position and the two features can be kept fully synchronised. What‘s more you can manipulate the waveforms graphically to refine the effects. Byron includes an extensive library of pre-programmed effects ’templates‘ that you can just select and use immediately. Amongst these are a number of Matrix effects designed to let you create impressive effects, on banks of LEDs (or other fixtures) quickly and easily. A traditional theatre technique, is to have the lights that are getting brighter fade in over a shorter time than the lights that are getting darker, fade out. Byron supports split fade times for intensity and let‘s you see both times in the Chooser and Timeline windows. Each cue also has a set of ’default‘ times so that you can change the fade times for the whole cue or event by event. ’Think visually, work visually‘ is the Vista‘s core idea, and the V2 takes this to the next level, providing ’detail view‘ windows that match the features of the devices they represent. 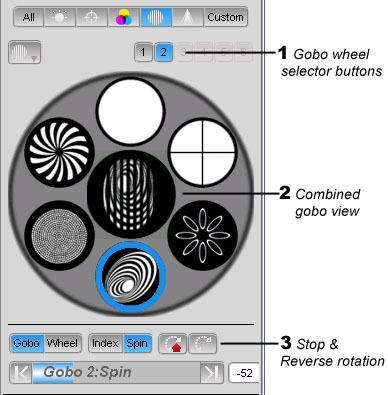 For instance, the detailed gobo palette depicts the gobo wheel(s) exactly as they are, with a central view showing the actual visual effect the gobo (or gobos) will generate. media server control with thumbnail import via CITP. So I started to use this new Lighting System today, there are a couple of minor glitches and mistakes in the program, but other than them. The Vista system offers a very visual experience to aid in the programming of your show. One of the best features in the update is the fact that it allows you to see the actual Gobo’s and Color Wheel of your intelligent lighting. The patching interface is also very simple. Will a beta version for Mac be made available in the near future? I know this is just out now as beta. Will there also be a Mac beta? We plan to have a Mac version available in the future but at this stage we don’t have a firm date. The Program freezes sometimes when saving. The Renaming the fixture Icon will glitch periodically. A lot of the American DJ Par Cans fixtures are malfunctioning. I love the fact that I can actually see my fixtures GOBO wheel and Color Wheel. The new interface has a way easier patching interface and Connecting the Universe is no where as difficult as it was before..
Must have the Mac version soon! We invested in the Vista software primarily due to the Mac interface. We purchased several iMacs to use as control units. Plus, most of our tech crew uses Mac laptops, which are set up as back-ups in case the main unit goes down. Please don’t let this go too long! Any date for Mac yet? Everyone that I work with is using mac and were all waiting for buying Vista and leave ETC. Hurry! Sorry but we don’t have a firm date for the Mac version as yet. You desperately need to get working on a mac version. Come on….We’re dying out here! Do you have a ballpark date instead of a firm date. Like…later this year or in 4 years. Do you guys have a date for the Mac version yet? Those of us using Apple computers would love to have all of the amazing features available in Byron. Please! We don’t have a firm date for the Mac version yet. At this stage the best option is to create a Bootcamp partition on your Mac, install Windows and run Vista v2 that way.